Image courtesy of Bob Gagliardo. 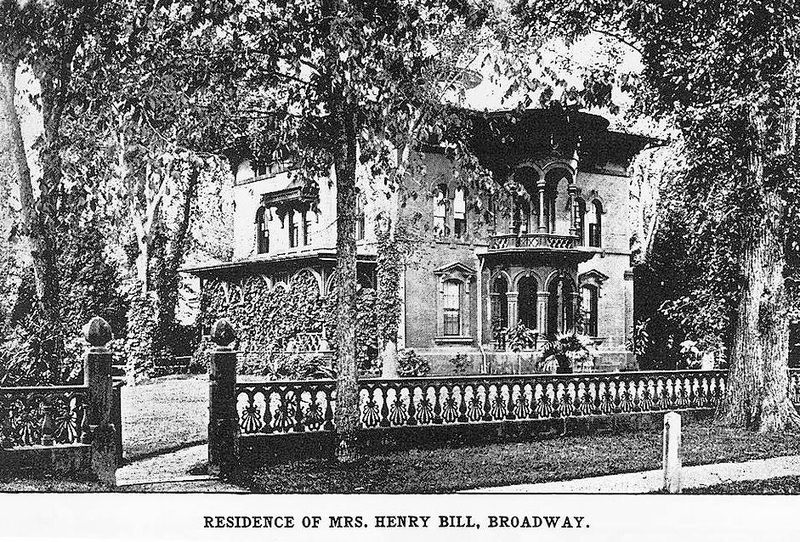 A man of numerous business, civic, and social interests, Henry Bill (1824–91) was a publisher, real estate investor, and philanthropist. His Henry Bill Publishing Company in Norwich specialized in scenic views, travel books, and his best-selling illustrated bibles. He donated Norwich’s Laurel Hill Park and endowed a library in his native town of Ledyard, Connecticut, that still bears his name. By 1880 Henry and his wife Julia Chapman Bill were living in this Broadway landmark, which they had purchased for $25,000—reportedly one of the highest sale prices for real estate in the neighborhood around the time of the Civil War. 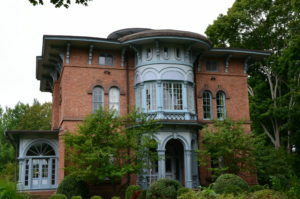 This exotic-looking brick house is noteworthy for its rounded front window bay, which creates a distinctive silhouette that is repeated in the building’s rooftop cupola. (Step back for a full view.) The house was purchased in 1930 by the Norwich Free Academy (#3) and long served as the school’s Home Education Department. It reverted to residential use in 1987, when its interiors were redesigned by the renowned architect Maya Lin (1959–), famous for her 1987 Vietnam Veterans Memorial in Washington, D.C.